The roots of the Legion of the Damned lie deep within the mythology of the future. 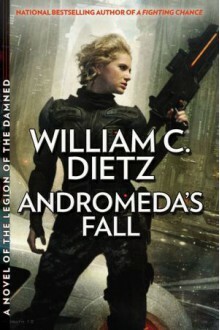 But now, national bestselling author William C. Dietz goes back to the Legion’s early days with the story of one recruit’s rebirth and redemption… Hundreds of years in the future, much has changed. Advances in medicine, technology, and science abound. Humanity has gone to the stars, found alien life, and established an empire. But some things never change... All her life, Lady Catherine Carletto (called Cat) has lived for nothing but the next party, the next lover, the next expensive toy. Until, in a bloodthirsty power grab, Imperial Princess Ophelia and her cadre of synth assassins murder her brother the emperor, and go on to purge the galaxy of his friends and supporters—including Cat’s family. The Carlettos are known to be staunch supporters of the Emperor and Carletto Industries has been in the forefront of his pet project—developing cybernetic technology for use by the masses. Now Cat, one of the last surviving Carlettos, is on the run. And, like countless others before her, she finds her sanctuary among the most dangerous of society’s misfits. Welcome to the Legion. Cat Carletto vanishes, and in her place stands Legion recruit Andromeda McKee. A woman with a mission—to bring down Empress Ophelia—or die trying.